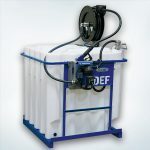 Fluidall’s Cost Effective Jobber Packages can easily be Reconditioned for Redistribution. Fluidall’s world-class fluid storage and handling solutions make a positive impact for our oil jobber partners. 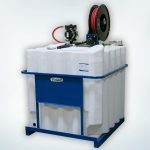 Our cost-effective packages for Oil, DEF and coolant store and dispense bulk fluids in a way that maximizes the efficiency of lubrication management and allows for bulk fluiddelivery, resulting in both increased profits for wholesale operations and reduced fluid expenses for customer operations. 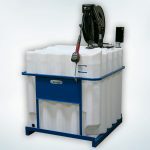 Easily reconditioned for redistribution, the compact tank footprints store up to 330 gallons of bulk fluids secured with a full pump and reel dispense equipment package. These Coolant, DEF and Oil Jobber packages all arrive fully assembled and are ready for placement at your customer’s location.